GitHub - nict-csl/exist: EXIST is a web application for aggregating and analyzing cyber threat intelligence. 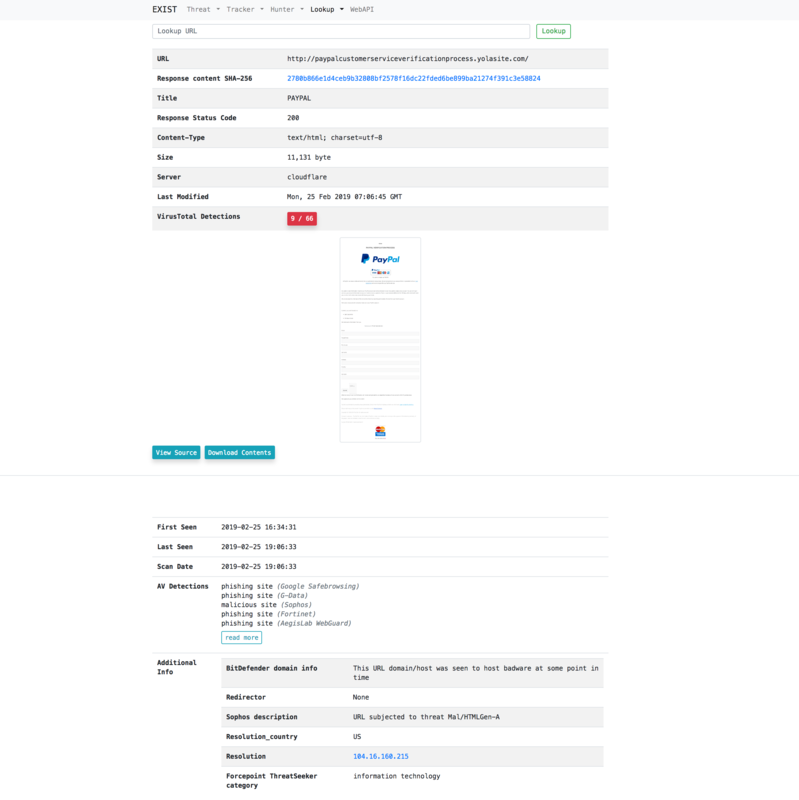 EXIST is a web application for aggregating and analyzing cyber threat intelligence. Want to be notified of new releases in nict-csl/exist? EXIST is a web application for aggregating and analyzing CTI (cyber threat intelligence). EXIST is written by the following software. EXIST is a web application for aggregating CTI to help security operators investigate incidents based on related indicators. 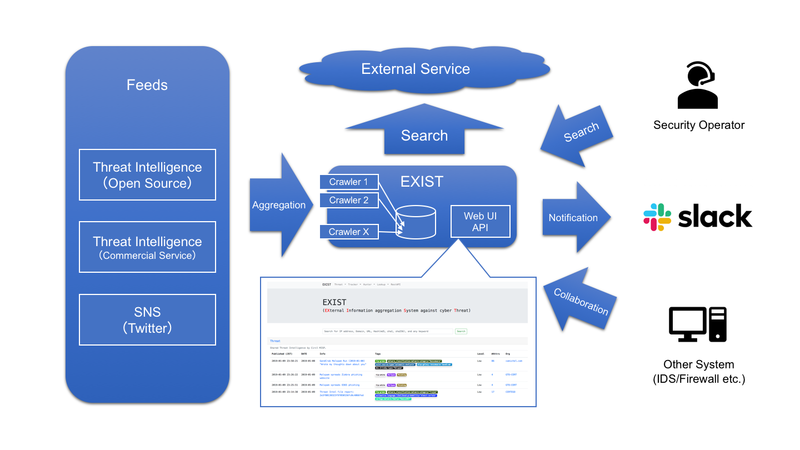 EXIST automatically fetches data from several CTI services and Twitter via their APIs and feeds. You can cross-search indicators via the web interface and the API. If you have servers logging network behaviors of clients (e.g., logs of DNS and HTTP proxy servers, etc. ), you will be able to analyze the logs by correlating with data on EXIST. If you implement some programs by using the API, you will realize automated CTI-driven security operation center. Just type domain in the search form. Just type url in the search form. Just add keywords in the Threat Hunter or Twitter Hunter. Tracker automatically collects data feeds from several CTI services. Hunter enables us to set queries for gathering data from several CTI services and Twitter. Lookup retrieves information related to specific information (e.g. IP address, domain) from several internet services (e.g. whois). Provide data stored in the EXIST database by Web API. After that I assume the environment of CentOS 7. Please at your own when deploying to other environment. Create intelligence/settings.py in reference to intelligence/settings.py.template. And edit according to your DB settings. Reputation tracker uses redis as the Celery cache server backend. Reputation tracker uses Celery as an asynchronous task job queue. Create Celery log and run directories. Access to http://[YourWebServer]:8000 with your browser. Note: I recommend to use Nginx and uWSGI when running in production environment. Scripts for inserting feed into database are scripts/insert2db/*/insert2db.py. Configuration files are scripts/insert2db/conf/insert2db.conf. Create it in reference to insert2db.conf.template. If you use MISP, write MISP URL and API key to insert2db.conf. If you use Malshare, write your API key to insert2db.conf. Create your Twitter API account in https://developer.twitter.com/ for tracking with EXIST.. Create an App for EXIST. Get Consumer API key (CA), Consumer API secret key (CS), Access token (AT), access token secret (AS). Write CA, CS, AT, AS to insert2db.conf. Note: To automate information collection, write them to your cron. Twitter Hunter can detect tweets containing specific keywords and user ID. And you can notify slack if necessary. Configuration files are scripts/hunter/conf/hunter.conf. Create it in reference to hunter.conf.template. If you use slack, write your slack token to hunter.conf. Create your Twitter API account in https://developer.twitter.com/. Create 18 Apps for EXIST. Get 18 Consumer API key (CA), Consumer API secret key (CS), Access token (AT), access token secret (AS). Write CA, CS, AT, AS to auth-hunter[00-18] to hunter.conf. Make scripts/hunter/twitter/tw_watchhunter.py run every minute using cron to make Twitter Hunter persistent. 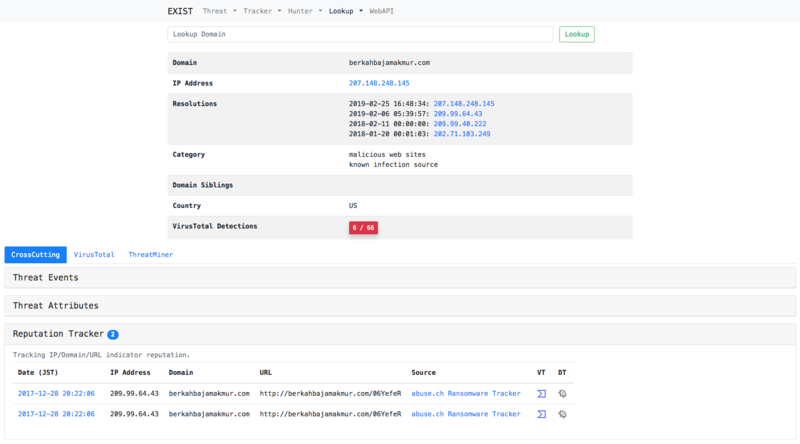 Threat Hunter can detect threat events containing specific keywords. And you can notify slack if necessary. Make scripts/hunter/threat/th_watchhunter.py run every minute using cron to make Threat Hunter persistent. Write your API-key to conf/vt.conf. Note: You get more information if you have private API key. Lookup IP / Domain uses GeoLite2 Database. Write the path to GeoLite2-City.mmdb in your conf/geoip.conf. Lookup URL uses wkhtmltopdf and Xvfb. Configuration files are scripts/url/url.conf. Create it in reference to url.conf.template. Make scripts/url/delete_webdata.sh run every day using cron to flush old Lookup URL data. Make scripts/url/delete_oldtaskresult.sh run every day using cron to flush old Celery data. Please e-mail us if you find any vulnerabilities.